Compared to the previous model, the Aspire S7 is pretty much the same on the outside, looking stunning from any angle you look at it. It combines glass and metal to give a premium feel, and it wouldn’t be exaggerating to say that the Acer was inspired by Apple’s iPhone 4 phone in terms of design. Samsung has become so obsessed with faux leather that they applied this design to its Ativ Book 9 laptop from 2014, but this year, the company abandoned it in favor of a metallic finish, although it isn’t prettier than the Aspire S7. In this article, we’ll tell you more about Acer’s new product, which received a speed boost thanks to the latest Intel Core processor and Intel HD graphics. You don’t need to buy an Apple MacBook to get that premium feel. There are plenty of other laptops which look amazing, and the Aspire S7 is one of our recommendations. It’s a luxurious ultrabook with a glass design that features a white finish, unlike other laptops that are available in predominantly silver or black. Even Apple ditched the plastic MacBook variant and uses only aluminum to build the cover of this elegant laptop. let’s go back to the Aspire S7 and its beautiful design. Its lid, which is colored in white, is extremely slim and on the left hand side it has the Acer logo painted in silver, which glows like Apple’s logo on the MacBook Pro. The glass on top of lid may look amazing, but it has a downside: it attracts fingerprints, but the good part is that the white color somehow conceals them. Acer protects the lid with Gorillas Glass, so it’s resistant to scratches, but we can’t tell you how long it will take until the surface becomes unaesthetic. On the opposite side of the lid Acer integrated a 13,3 inch LED back light screen that supports full HD resolution of 1920 x 1080 pixels (it was downgraded from 2,560 x 1,440 pixels – the resolution supported by the previous model) and has 16:9 aspect ratio that feels a bit narrow. Other reviewers prefer the Surface Pro 3 with 3:2 aspect ratio, or the 12inches MacBook which has 16:10 aspect ratio. However, the Aspire S7 is a good option for students or other users who are looking for a tablet with a wide viewing angle, supporting a 180-degree hinge. 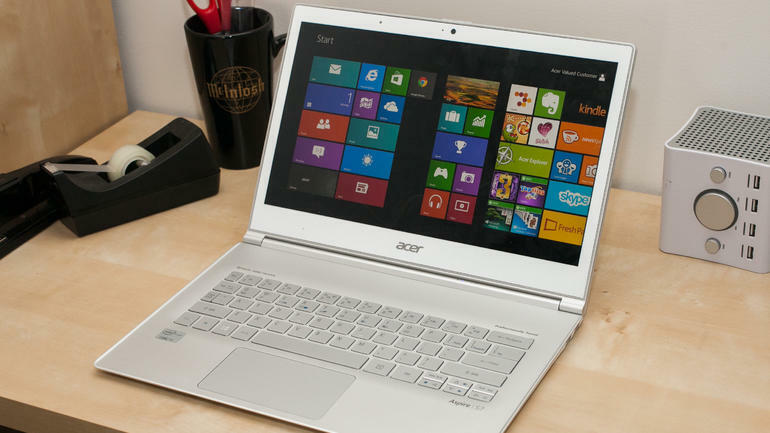 A 360-degree hinge would convert the laptop into a tablet, but Acer preferred to keep things simple. If you want a laptop whose screen can lay flat, then buy the HP Spectre x360. The keyboard deck is made of aluminum and the keys are painted in silver, but the row of function keys is missing and you can find them alongside the the top number row, being accessed with the Fn button. The Caps Lock button has been miniaturized, the Delete key sits on the bottom, near the arrow keys and the tilda key. At night, you can enable the keyboard backlight, which will glow as a blue-green shade, but the color doesn’t seem to be tiring to the eyes. Obviously, below the keyboard was placed the tranckpad, which is pretty large and looks like the one from the MacBook line. The bottom of the laptop has a white matte plastic cover which in time will flake off. The sound comes out of the stereo Dolby-branded speakers from the bottom, the audio quality is very high although there is a small sound distortion when the volume is turned to the maximum. On the left hand side you’ll find the side-mounted power button, which sits between the USB 3.0 port and power connector. 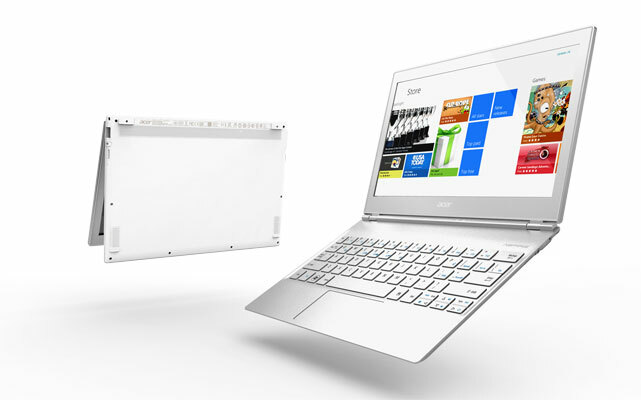 As for the dimensions of the device, the Acer Aspire S7 measures 32.31 x 22.30cm (the frame measures 1.3cm) and its weight is 1.30 Kg. The Acer Aspire S7 is powered by the 5th Generation Intel Core i7-550U dual-core processor clocked at 2.4GHz (up to 3GHz with Turbo Boost), it has Intel HD Graphics 5500 and 8GB of DDR3L SDRAM (dual channel). The internal storage is 256GB SSD and the battery is four-cell, with a lifespan of 10 hours under mixed usage. The laptop lacks a fingerprint scanner but it features a built-in web cam with a resolution of 720p. The list of ports include two USBs 3.0, HDMI with HDCP support, microphone jack, combo headphone, a SD memory card reader, a charging port, Mini DisplayPort and the connectivity options include 802.11ac Wi-Fi (dual-band), Bluetooth 4.0, Intel Wireless Display and TPM 1.2. In the Cinebench CPU test, the Aspire S7 obtained 193points and achieved 24fps in the GPU test; in the PCMark 8 Home test it scored 2,703 and the battery lasted 3 hours and 38 minutes with the level of brightness set at 50 percent. Also, in the 3DMark Fire Strike test, it scored: 693; in the Sky Diver test, it scored 2,585; and in the Cloud Gate test, it had a score of 4,955. The laptop can be purchased from the official website of Acer, where it costs $ 1699.99.